Out of all the indie games I made time for at PAX West, there was one that felt wholly unlike everything else. Tucked away in an inconspicuous area of the show floor was the Fellow Traveler booth, housing Chance Agency's unique narrative-driven game Neo Cab. Thinking back to the brief but incredibly sweet trailer shown off during the PC Gaming Show back at E3 2018, I knew I had to experience this neon thriller for myself. I went hands on with Neo Cab, taking on the role of Lina Romero. She'd been working a late shift as a Neo Cab driver, having just moved to the AI-controlled futuristic city of Los Ojos (fittingly called "The Eyes" in Spanish). As one of the last human cab drivers, with the rest having been replaced by automated cars, Lina doesn't quite fit in with the rest of the city, which has long since switched over to surveillance-laden systems. You need a "Capra account" to survive, or some sort of identity to propel you forward. You need to be able to be tracked. Lina has none of this, but she's looking to move in with her friend Savy, as she finds herself penniless and looking for quarters. The demo began on the same night Lina was meant to meet her, only it becomes immediately obvious that this simply isn't in the cards. Savy, aside from a few short messages, stopped answering Lina's texts and phone calls, and had apparently ghosted her best friend. The only thing to do, then, was work a Neo Cab shift as Lina, picking up "pax" (passengers) who were still on board with having a human drive them around. My brief time as a Neo Cab driver was punctuated by two very different fares: A couple on their first date and a very intriguing fellow who had a penchant for pain, suffering, and the darkness. That's no supposition: He said it himself, after all, seeking the "pain worm," whatever that meant. These weren't random pickups, as I was able to select the fares from the menu, so while there may have been additional characters available in the demo, these were the stops I was allowed to make. The couple was obviously having issues with communication. The woman wasn't sure about her obnoxious partner's insistence upon taking a Neo Cab with a real human driver, nor the suggestions I would provide them about where to go drinking. I was able to select various dialogue options during their "date" that put me siding with either the woman or the man, though the man's demeanor and condescending manner had me firmly in the woman's corner. Unfortunately, the date's direction, which culminated in Lina kicking the man out and taking the woman to her original destination, the bar she was interested in going to in the first place, didn't bode well for my driver rating. The jilted date left me a one-star review and some other nonsense upon leaving, which tarnished my overall driver score. Much like Uber or Lyft drivers, your score is all-important if you're going to remain employed, and while there wasn't much to explore in the demo by way of how this could affect gameplay, Lina was quite worried about its effect on her livelihood. The woman had offered to make things up to me by inviting me out to grab a drink since she couldn't change my driver rating (her name wasn't on the reservation). I wanted to accept and see if dating mechanics would open up, but the demo gently chided me into declining, because I was waiting on my friend Savy's all-important phone call or text. Between stops to pick up passengers, I ended up being pulled over twice by the creepy cops. I wasn't sure if they were robots or just black mask-wearing freaks, but they sure did harsh my vibe. The first police stop was because I made the decision to pick up a passenger in a zone that required me to pay more. I had to pay a fine during the somewhat terrifying police stop but also fell victim to some police bribing tactics. By paying a fee, I became a "friend" of the police and would apparently not be bothered, a position I got myself in somewhat precariously. The second and final time was much more ominous, as I was pulled over after receiving a somewhat harried call from Savy. This time, she was communicating with me in hushed tones, telling me to hurry over to her. But I couldn't get to her, not as quickly as I wanted to. I was being pulled over by the cops and I just knew something was about to go down. Like Lina herself said, I hoped her face wouldn't light up during the stop. The cops asked me if I knew why I had been pulled over, but their chattering to each other in person and on the radio told me everything I need to know. Savy had done something, or something had been done to her, and it looked like my night was about to get a whole lot longer. Unfortunately, the demo ended there. I found myself getting angry as I rose from the demo station and made my way over to the attendants at the booth to let them know I had finished. I had and still have so many questions. What did the cops want? What happened to Savy? When could I play more? The game's been on my mind nearly every day since I left the booth, and I've ben aching for more ever since I hopped into the Neo Cab. I'm longing for more of the cyberpunk vision of the future, its expressive characters, clinically cool techno, and Lina Romero herself. Unfortunately, I won't be able to give the full thing a go until it finally drops sometime in 2019. Make sure you mark this one down as a must-play on your calendars. Neo Cab is high on my interest list and this write up ensured it remains there. Wish I'd had the chance, but this show I ended up not having time to play anything. Glad others did though! 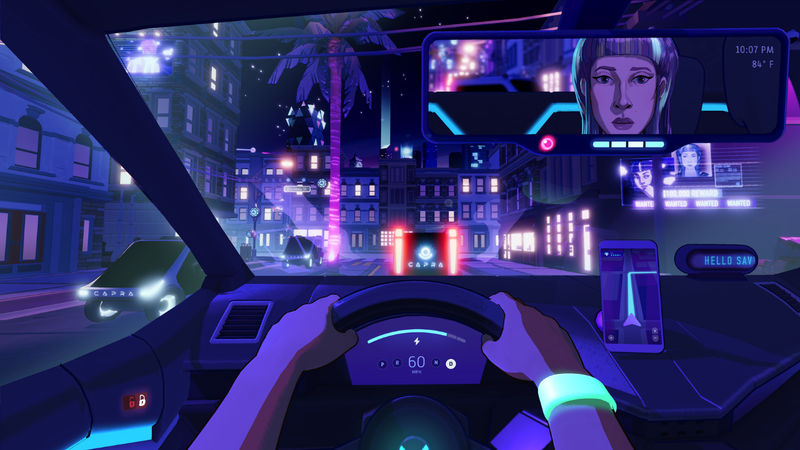 "In a Lyft from the airport to show Neo Cab at #xoxofest and the driver has tricked his car out with UV trim and footlights, and with a sign that feels straight out of Los Ojos."